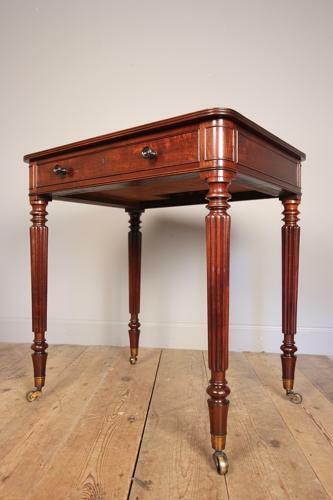 A George III Mahogany Gillows Chamber table is superb original condition. This elegant table stands on slender reeded legs, retaining the original brass gilt castors, with reeded edge top of which has a lift up compartment for writing materials. The single Mahogany lined drawer retaining the original turned knob handles and stamped by the makers to the inside of the drawer. Superb colour, patina and original condition throughout this Iconic piece. English, Circa 1815. This design of table appears several times in the Gillows sketch books. The first is believed to have been ordered for a T W. Egerton of Tatton Park Cheshire in 1811.